From Mediaite: Months after tragedy in Newtown, CT, the gun debate rages on. Mediaite reports on the latest: “Speaking to reporters yesterday, Sen. James Inhofe (R-OK) said President Obama and his administration have been ‘unfair’ to the families of the Newtown victims. They’ve been made to think the gun control debate “has something to do with them,” the senator asserted — but that isn’t the case. According to the Huffington Post, Inhofe talked to reporters, commenting on the family members of Newtown victims who met with senators in Washington yesterday. The private meeting was about legislation that would increase restrictions on guns. 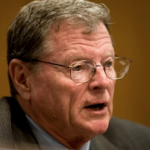 ‘See, I think it’s so unfair of the administration to hurt these families, to make them think this has something to do with them when, in fact, it doesn’t,’ Inhofe said, per the report.” Read the whole piece here. From Gossip Cop: After the death of one of its cast members, MTV has allegedly cancelled Buckwild. Now, the producer is blasting the network, reports Gossip Cop: “‘Buckwild’ has been canceled by MTV, according to multiple reports. The decision comes just a week after the death of cast member Shain Gandee, who died from carbon monoxide poisoning when his truck became stuck in mud. Producer J.P. Williams tells THR he’s angered by the cancellation, pointing out, ‘This is the network that has shows about teen pregnancy. They’ll stick by a show that allows you to abandon a child,’ he says, ‘but a kid dies by accident doing what he does for a living [mudding] and they cancel the show?’ ‘There’s something that smells of sh*t here on every level,’ complains Williams.” Read more of what he had to say here. From Geekosystem: An unusual political story from Florida, writes Geekosystem’s Ian Chant: “I grew up near Chicago, and thus have an abiding respect for dirty, low-down, mudslinging politics. Every once in a while, though, the rest fo the world proves that they can still teach the City of Broad Shoulders a thing or two about really ugly politics This week, it’s Florida, where North Miami mayoral candidate Anna Pierre thinks that one of her opponents — or their supporters — is using voodoo rituals to try and sink her campaign. 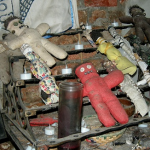 In the last three months, the Miami Herald reports, items like chicken feathers, scraps of food, and dolls with pins in them have been left on the doorstep of Pierre’s campaign office, suggesting that someone who wants her out of the race has decided to use that voodoo that they do so…poorly, I guess, considering she’s still in the race.” Read the full story here. From Styleite: Another controversy for American Apparel, writes Styleite: “Here we go again. For the third time in just over a year, American Apparel is in hot water with the UK’s Advertising Standards Authority for their raunchy campaigns. Is anyone in the least bit surprised? This time around, the watchdogs upheld two complaints lobbied against the California-based retailer. One set of photos features an American Apparel employee named Trudy lying on a bed wearing a sweater and not much else, which, according to their adjudication, was deemed offensive and inappropriate: ‘We considered the image to be gratuitous, particularly in an ad for knitwear. '” Read more about their offenses and see the ads here. 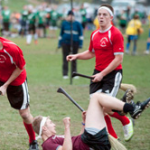 From SportsGrid: Today, the site reports on a less-mainstream sport: quidditch. SportsGrid’s Rick Chandler writes, “Your closet Harry Potter fandom is no secret here, which is why we’re sure you’ll be traveling to Kissimmee, FL, on Saturday for the Quidditch World Cup. That’s where 56 teams from four nations (notably, none of them England) will square off for the Quidditch Cup, or whatever they call it. Get ready for fierce action between college kids tossing a tetherball while running with broomsticks between their legs … just like in the movie. It may surprise you to know that many U.S. universities have quidditch teams … I’ve seen them playing while driving by the Stanford campus, for instance. Money well spent, parents!” Read on here. 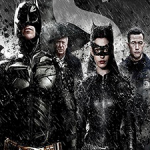 From The Mary Sue: Christopher Nolan’s Intersteller has cast its first The Dark Knight Rises actor. But which one? The Mary Sue reports, “That would be Anne Hathaway. Nolan apparently really liked working with Ms. Kyle, because she’s reportedly close to signing on to co-star in Interstellar with Nolanverse newbie Matthew McConaughey. As before, there’s not really much to say about the film: It’s hard sci-fi, about time travel and space exploration, and is based on the theories of physicist Kip Thorne. We know the name of McConaughey’s character—Cooper—but not anything else, and nothing at all about who Hathaway will play. If we actually knew things it wouldn’t be a Nolan film, now would it?” Read the story here. From The Jane Dough: The site has a piece today that’s indicative of the current state of the publishing industry, discussing the $500,000 Cat Marnell has received for her book proposal. Says The Jane Dough’s Sarah Devlin, “Cat Marnell finally got it together enough to write a book proposal. And then she got a $500K advance…which is almost emphatically not about the quality of the proposal/book as it is about drumming up publicity. This is the world we’re living in… I do think that, even though I can’t stand her shtick and I think everyone who is giving her money/a platform is being an enabling piece of garbage, she can write a good sentence. It’s not crazy to me that someone wanted to give her a book deal.” While editor Colette McIntyre responds, “I am STUNNED. I agree that it makes sense for the book publisher to offer a deal to this insane, narcissistic festering wound of a person who has a cult following and the entire Internet just wrapped around her coke nail…but you actually think she can write? !” Read more of their argument here. From The Braiser: Today, the food site gets political – sort of. They write, “Boo furloughs! Boo sequestration! Boo Congress triggering their own across-the-board budget cuts as a result of an inability to come to a bipartisan compromise to trim the federal budget and avoid raising the debt ceiling ad infinitum! You might ask, why we, the Bravo-obsessed The Braiser, are protesting the intractability of Congress this morning, since it is not our normal business. 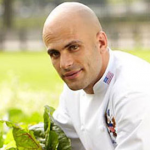 It’s because handsome Sam Kass [hite House Personal Chef and Senior Nutrition Policy Advisor] was furloughed… he and 480 staffers on the White House budget (cooks, housekeepers, etc.) will be placed on mandatory unpaid leave during the summer as a result of the government-wide sequester, because Kass, unlike a bunch of very important but totally not as handsome meat inspectors, is not important enough to get his own emergency budget authorization vote in Congress.” Read on here.